For the pop-up, Steele (who is, of course, the eponymous cook) created a short menu designed to represent the type of food she’ll be serving at the restaurant: There were little cornbread mini-muffins; a big, shareable platter salad (wild arugula, blood orange, beets, goat cheese, and toasted pumpkin seeds); and soft, hand-cut fries. Crab gumbo was the best dish of the night. Of course, fresh Tomales Bay oysters, both raw-on-the-half-shell and simply roasted, featured prominently — it seemed like every table ordered a round or two. 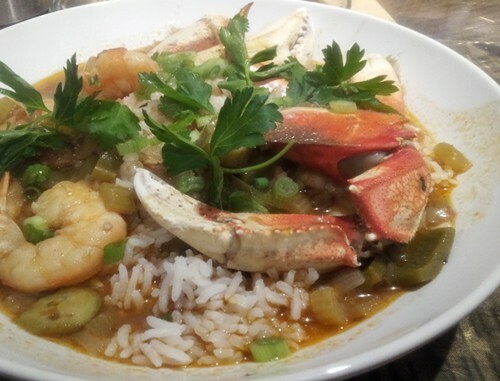 But the best dish was a generous crab gumbo entrée, which at first seemed a touch underseasoned, but whose clean, earthy flavors grew on me with each soupy, comforting bite. The Cook and Her Farmer will be Steele’s first Oakland restaurant, but she’s no newcomer to the food world. Her grandparents founded Nepenthe, the legendary Big Sur institution, in the Forties, and about twenty years ago Steele herself started Cafe Kevah on the same property. It was probably the first cafe-restaurant in Big Sur that sourced all of its ingredients locally and organically, according to Steele. Her new venture will have that same ethos: simple food prepared with well-sourced produce and seafood. “I personally hunger to just go out and have a really great simple meal that doesn't have too much fuss,” she said. The Southern connection comes from Steele’s partner in the venture, Steven Day (the “farmer”), who grew up in Memphis, and from her own childhood summers spent in Atlanta. Those Southern roots are also the inspiration for the restaurant’s oyster focus. Steele said she isn’t trying to create another Hog Island Oyster Co. — the kind of raw bar you’d typically find in the Bay Area’s coastal areas or in, say, New England. Instead, they aim to celebrate another oyster tradition: Po’boys will be on the menu at least a few days a week. Steele and Day will be working with Tomales Bay Oyster Company to bring the bivalves in straight from the source, having both having spent a year up in Marshall getting hands-on experience with oyster farming. Steele is hopeful for a late-spring opening, though construction is on hold until EBALDC, the nonprofit that owns the building, completes some infrastructure work on the space. Once complete, the 800 square-foot restaurant will occupy the frontmost section of Swan’s Marketplace, directly across from Cosecha. 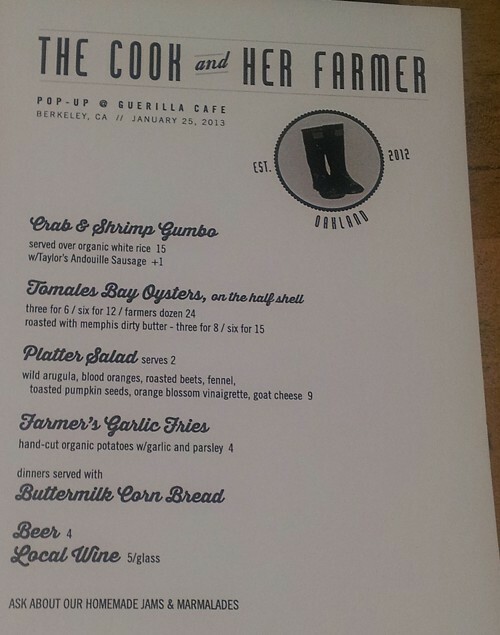 In the meantime, The Cook and Her Farmer has two more Friday-night pop-ups scheduled at Guerilla Cafe, one on February 8 and another on February 22 — both will run from 6:30 to 10 p.m. If those are a success, Steele might schedule a few more events in March. Next week’s menu will be similar to the one for Steele’s most recent pop-up: oysters, fries, a platter salad, a homemade dessert (probably pound cake), and a Southern entrée special that, as of this printing, hasn’t yet been finalized.